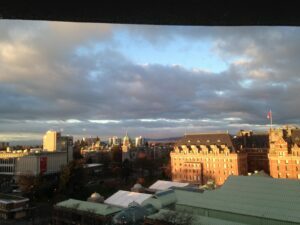 Back in January 2017, still reeling from our U.S. election results, I posted my intention to visit Canada, after a long absence, for a fresh perspective. 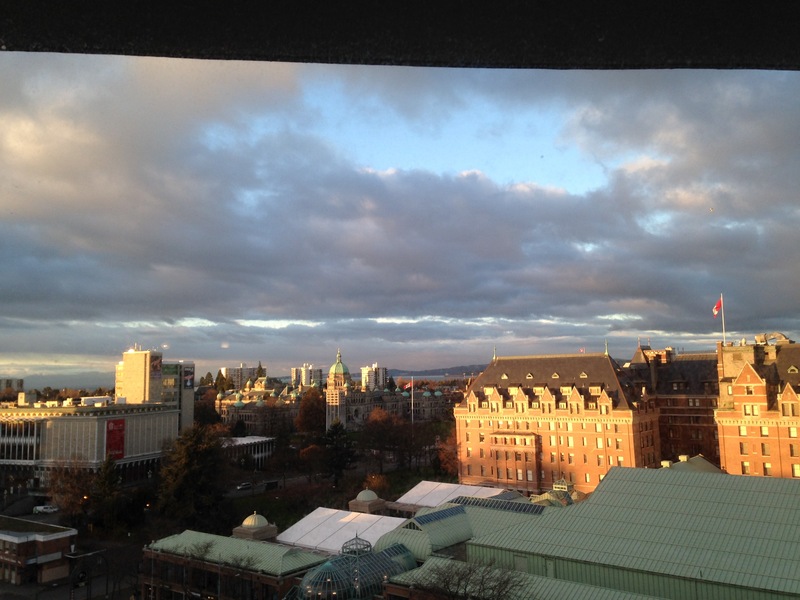 In December, I finally made it to Victoria, B.C. on Vancouver Island, in two short flying hops from Bend via Seattle. Like that friendly next-door neighbor who, despite being annoyed at your barking dog, still welcomes you in and offers coffee when you show up, Canada embraced my husband and me –– embraced us literally in an evening of tango at Cafe Casablanca (2524 Bridge Street, Victoria) with Tango Pacifico (www.tangopacifico.com). Distinguished Canadian author, David Gurr, was DJ that Friday, and a smooth lead in a community of impressive dancers. Cafe Casablanca’s weekly milonga is well-worth the trip to the spectacularly beautiful island. Other Victoria highlights: delicious vegan dining at “Be Love” (www.beloverestaurant.ca); the superb paintings of Emily Carr, who seemed to have channeled the soul of Vancouver Island’s forests; and Munro’s Books, where Alice Munro (yes, that Alice Munro) once tended the till, and a kindly employee offered us non-sectarian prayers for our country. 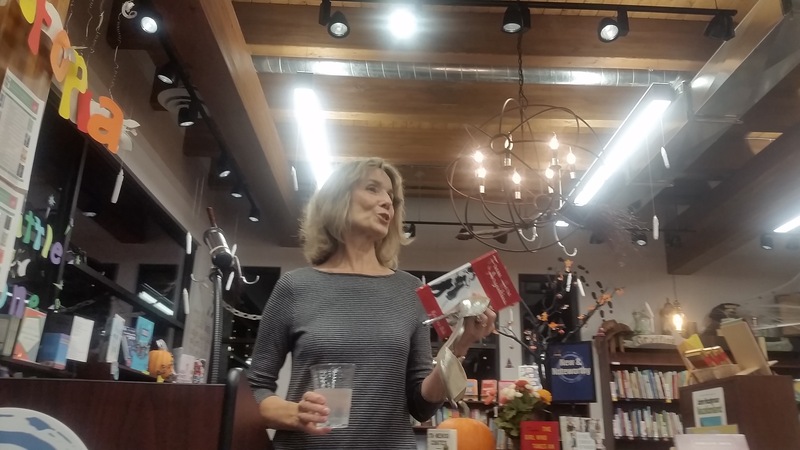 Reading From Here to Argentina: A Tango Love Story at Roundabout Books in Bend’s NW Crossing Friday evening was a joy. 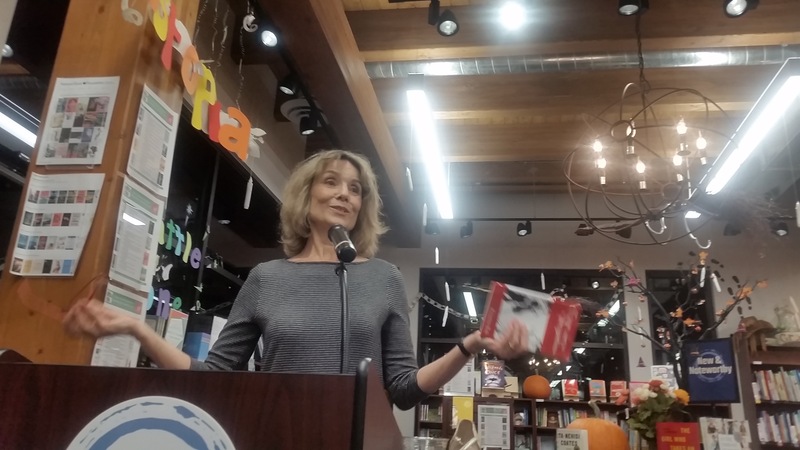 I love reading to a live audience and meeting other writers and readers. 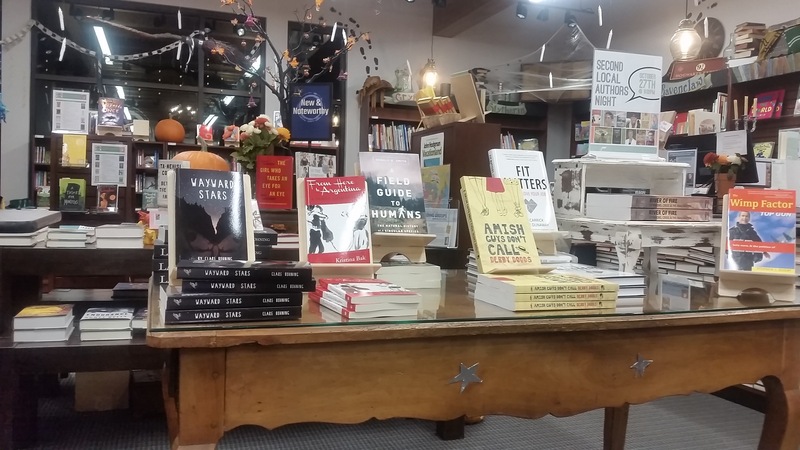 Thanks to Cassie of Roundabout Books for all she does to enliven the Central Oregon literary scene! You can find my book at her store. Fictional characters, in my writing experience, show up fully formed, and my happy task is to explore who they are. The character, Mikhail, stepped out of my imagination into view as the song’s singer. It occurred to me that “meeting” Mikhail was much like going to my first Argentine Social Tango classes, embracing my partners in tango’s intimacy before I knew anything else about them, certainly not the depths of their pasts, or their aspirations beyond learning the subtle and complex dance. 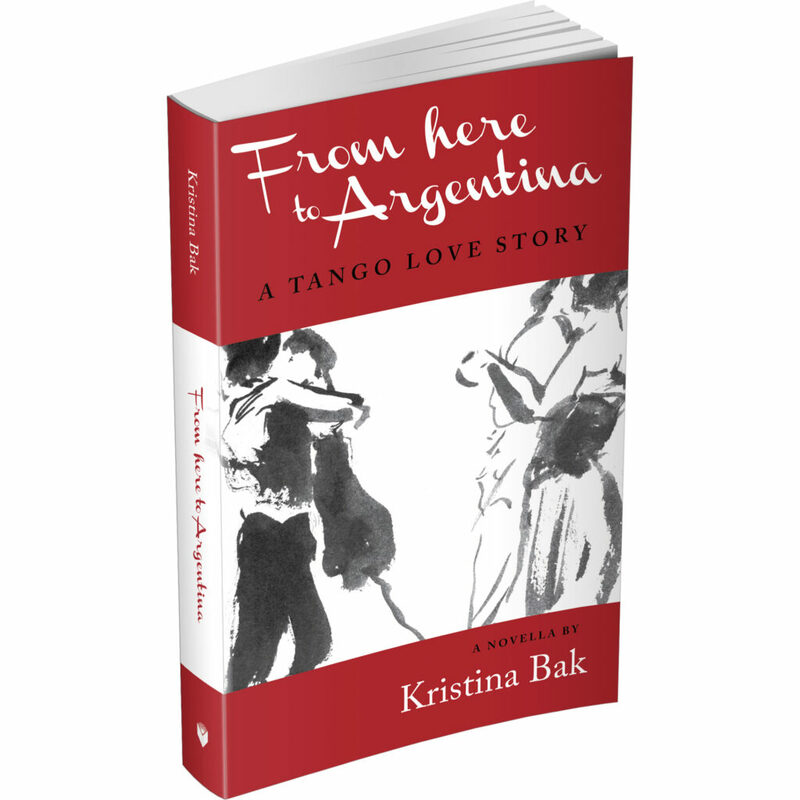 I set myself the challenge of throwing five equal protagonists together in a tango class in my short novel. Juniper, Dan, Esteban, and Rosalie joined Mikhail, the music began, and we were on our way. “In dark times be the light.” I don’t know who I’m quoting, so many wise people have said this. As we pass through these dark times, let’s put the emphasis on the verb. Everything passes. We have choices in how we ride it out. My immigrant grandmother Anna was a great inspiration to me in my understanding that, at the risk of repeating myself, again, every moment is a choose-your-own-attitude opportunity. The events of this long winter have left many of us wanting to cover our heads and hide beneath the blankets. History has shown us where that leads. If you need attitudinal inspiration, watch Groundhog Day again –– again. Spend time with friends and family in person, without a digital screen between you. (This suggestion courtesy of my friend Jana Zvibleman.) Besides being kind to yourself and others, besides supporting your community (however you define community), expand your vision. Visit other countries and talk to people there to learn their way of being. I’m planning a long-postponed trip to Canada (no, not moving there, just visiting) to reacquaint myself with nearby cross-border neighbors who have a surprisingly different perspective of the world, and much to teach us. Pick your border, north or south, and explore. Further away, Professor Huixiang Chen and Dr. Pingping Li are leading another enlightening qigong immersion China tour this April. A number of you visited my studio last year when Sandra Kunz shared her experiences on the 2016 trip. You’ll learn more about the opportunity, and qigong, at www.wisdomandpeace.com. Let’s embrace excitement and action, not fear, in 2017. Let’s all be the light in whatever way we choose. “This doesn’t feel like my country anymore,” a friend told me over brunch in a Manhattan vegan restaurant, while a young man with a shiny lip ring and no eyebrows above his lettuce-green eyes sweetly served our black bean enchiladas with cashew cheese. I understood what she meant. Heartbreak and d enial were my first responses to the presidential election results, too, but those reactions take you, or me, nowhere. I understand the urge to march in protest. I was among the many of my generation who filled Seattle streets protesting the Vietnam war, and I kept marching there and in Sydney for other causes for decades. I like to believe we made some difference. If you feel that demonstrating against bigotry, hate, and ignorance will make a difference now, I respect your choice. Sometimes that’s all that’s left, as appears to be the case in North Dakota. My brunch companion takes a different course. Over coffee she explains. Now in her late eighties, she works with organizations in her town to provide shelter for women in need, to help elders stay in their own homes, to promote education for children, and to protect the natural environment. Her action is as radical as marching in the streets, and much harder to sustain. Radical and sustained action is what will rescue our nation from violent division. Most radical is education, as it has always been. A populace educated in gathering information, understanding history, and thinking globally and critically is equipped to solve problems creatively, rather than pretending they can wipe the board clean. The many acts of generosity I witnessed and experienced the day after the election reaffirmed to me the importance of community. If you feel overwhelmed and helpless, start small, with one deliberate act of kindness, one appreciation of something good and beautiful, each day. Here in Central Oregon, donate time or resources to organizations like SMART or Younity, which build confidence, strength, empathy, and skill in children who will be making decisions for themselves and future generations. We’re all in this great adventure together. Today I celebrate the Festival of Archangel Uriel who visited me, an angel skeptic who had never heard Uriel’s name, nearly two decades ago. I had no interest in, nor any familiarity with, archangels in any form then, much less the twenty-foot-tall winged being made of intense blue light who “spoke” to me clearly, without sound. Uriel has never appeared to me again, yet never left me, either. Uriel gives me courage to add my small voice today to the chorus demanding that we hold and nurture hope in these times of horror. In such times we can choose to let in the light. When we’re told peace is impossible, we must hold on to the Reality of Impossible Things. When we suffer so many causes to mourn, we must allow moments of beauty and joy as never before. Not one of the famous archangels, there’s nothing easy about Uriel. Uriel demands we accept the challenge to act toward one another as though we see the angelic light in each person we meet, and within ourselves, even when fear threatens to dim it. This winter after my mother died was long and bleak, though in “reality” no longer or bleaker than others. I’m returning from that darkness with my first note of 2016 and one last story about my mother. She left me a gift I dreaded and saw at first as a curse: ninety years worth of newspaper clippings, magazines, letters, notes, photos, worn and never-worn clothes and shoes, tangled costume jewelry, flattened cereal boxes, diaries, half-empty perfume bottles, old red lipsticks, plastic bags and cloth scraps, on and on, waist-deep beneath dust so thick I had to wrap a scarf around my mouth and nose to breathe sorting it. I kept up a running commentary on my disgust, humiliation, and anger even as my mother’s secrets emerged from the layers like the excavation of an archeological dig. I was exhausted and filthy finishing with the worst of it, and hoarse from arguing with her for hours on end. The gift came when at some point I saw her through her stash, beyond the mother who was never “motherly” enough for me, to the woman who was wholly herself, without apology, a woman of strength I could mourn with love and respect. She held me there despite myself until both of us were freed from my habitual sense of lack and resentment. I carry that lesson with me now, to see others around me with fresh eyes, less judgement. Thank you Mom. This is where I’ve been for half a year, a healer healing, fragile, confused, blinking now in the welcome spring sun. I’ll post new announcements about my work soon, Qigong, easing the lightbody, and more. Meanwhile, my radiant, powerful friend Teryl “T” Johansson has a new book out, Silver Talons, Sacred Prey: Stories To Rattle Your Ancient Shamanic Bones. Find illuminating adventures with T at www.sacredaerie.com. Those of you who filled my studio for Sandra Kunz’s November presentation about her Qigong trip to China may have noticed the recurring angel theme in my paintings on the walls. Or maybe not, given that Sandra kept us all fascinated with her stories. That’s how it is for angels in our lives. We’re surrounded by them and seldom notice. We are them and we discount our power to call in blessings and work small miracles that change the lives of others. I was blessed to be surrounded by angels thinly disguised as human beings the day after Thanksgiving when my mother (whom I’ve written about in these pages October and November, 2013, and April 2015) made her transition from this life into the Great Mystery at nearly 91. My husband and I and my stepfather were beside her in the beautiful “Cottage In the Meadow” hospice house in Yakima. Our sadness was tempered by the deep respect and kindness of the hospice staff. My mother at her death was touched by beauty and free from fear. What could have been terrible for her and for us was profound. I’ll be making holiday donations to both the Yakima,Washington and Bend, Oregon hospice houses in gratitude, and I encourage you to consider doing the same in your community. Also in gratitude, throughout 2016 I’ll be offering free Exploring Angelic Dimensions sessions. Please call with questions and to schedule. Meanwhile, if you want to see what angels look like, try looking in a mirror, or across the dinner table. Wishing you blessings for the solstice, and all the season’s holidays. This spring my friend and Chinese Essence Qigong student, Sandra Kunz, accepted an invitation to visit China with the esteemed qigong master, Huixian Chen, the beautiful woman you see in this photo. Sandra brought me the photo as a gift when she returned, and I was immediately struck by the way Chen’s energy projects from it, a palpable tonifying of my own qi/life energy system and that of any viewer. Take a moment to look at the image, absorb the loving energy beaming from Chen’s smile. That’s a gift from her to all of us. While practicing qigong can be a profound stimulus for spiritual development, qigong itself is not a religion and requires no “belief.” It takes no special skill, only the willingness to pay attention to directing your energy, your qi, with your mind, and to your movement and breathing. As you begin a regular daily practice, qigong teaches itself in a feedback loop of experience and sensation. In my fourteen years of practicing Chinese Essence Qigong it has rewarded me with peace of mind, good health, perspective, and flexibility. Chen intends to lead another trip to China in 2016. After hearing Sandra’s qigong stories, you may be inspired to go along. You can find Chen’s autobiography, Life Is Always Smiling on Amazon. Ideas shoot through my awareness like summer meteors in the Perseid shower. As I try to harness wild interests and choose my topic for September, I slip back to being 10 years old, trying to separate a reluctant saddle horse from our shifting herd. A gangly gray and white half-wild pinto, Paint was descended from the great 19th Century herds Yakima Chief Kamiakin ran on Ahtanum Ridge. Paint probably didn’t like me, for good reason. I rode him harder than I should have, galloping dusty reservation roads. I raced anger and grief at my parents bitter divorce, and later sadness and confusion when my powerful grandpa was felled by a stroke in the bull’s corral. No matter how fast Paint ran, neither he nor I could escape what I didn’t yet know to call Impermanence. Oh, but we tried. My adventures unreeled framed by Paint’s ears. I don’t know what finally happened to Paint. When I returned from my first college semester, my grandparents were in a nursing home, the old ranch house stood empty, listing to one side as though only the life going on inside had kept it upright. Someone had done something with the animals; I didn’t have the heart to ask what. Paint may, like many unwanted horses, have become dog food. Meanwhile, life is sweet despite strange times, strange seasons. Qigong helps me meet each day with minimal anxiety and reactivity. I have space for two more participants in a Chinese Essence Qigong beginners’ workshop, two sessions, Tuesday September 22nd, and Friday September 25th, 2pm to 4:30 at my studio. When you call me at 541.390.9652 or email Kristina@kristinabak.com I’ll tell you more about this, as well as other times, tutorials, and events this fall. Save the date: Monday evening, November 16th, gather at my studio to hear photographer and Qigong practitioner Sandra Kunz tell the story of her travels in China with Hui-Xian Chen, the venerable woman who introduced many of us to Chinese Essence Qigong. Hui-Xian Chen’s amazing autobiography Life Is Always Smiling is now available in paperback, as well as on kindle, at Amazon.